Which food you tried to cook back home after a food travel experience? I came back from Korea only wanting Korean food, but too poor to keep buying it in K-town every day. I’ve learned to make a pretty mean kimchi jjigae, which makes NYC winters much more bearable! Dad and I recreated salmorejo when we came back from the south of Spain. By Dad and I, I of course mean just Dad. I still think of that soup fondly. Still wondering about a drink we had on the island of Dominica. We were taken by dugout canoe to a jungle bar. They poured a small amount of clear liquid into the bottom of a small shot glass and topped it off with the juice of some local berries. The resulting drink, called Dynamite, caused out lips to go numb on contact and was quite potent and delicious. Our friends returned to the island several years later and attempted to find some Dynamite to no avail. Now I need a way back to Dominica to experience it again. I havent been back yet from my current trip but I will definetely try to make the chicken biryani learned in Hyderabad, India! It’s not really something cooked as its pretty simply made , but after living in Brazil with my girlfriend and her folks I often had this desert which I love. There is something delicious about the contrast of savoury cheese and sweet guayaba fruit. 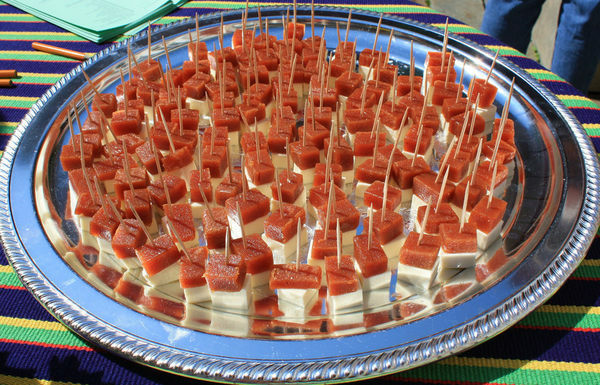 Brazil's Romeu e Julieta pairs salty, white cheese with guava paste. Recently was feeling nostalgic for Brazil so managed to find a Brazilian deli in London and bought some goiabada paste, then as the article above suggests I used some Mozarella but it didn’t really have the same taste. So have to wait a couple of months more to savour some authentic Romeu e julieta again. This may be a ridiculous answer, but cheddar and (Branston) pickle have become a staple at our house since visiting England several times. I was so happy to find my supermarket actually carries Branston pickle. Put all ingredients in a pot and simmer for about a half hour. Pour the wine through a sive put back in the pot then add 100 grams raisins and 50grams chopped almonds. Simmer for 5 minutes. Serve warm. Oh, wow, thanks so much for this! Looking forward to giving it a try—will report back! Welcome, hope it works for you. I was in Monterrey, Mexico on work a few years ago. Due to time and, ah, security, I didn’t get to leave the hotel or job site much, and most of the hotel offerings were pretty dull. But one thing they had which I’d never seen before was encochidoes. The variant I had is apparently pretty specific to Monterrey. You fry two eggs, then top with queso fresca, a warm tortilla, and cover the lot with salsa roja - or half salsa roja and half salsa verde for divorciados. I used to make them with some frequency, but sadly I can’t handle the cheese nowadays. I lived in Japan for two years, and when I came home and bought Japanese sweet potatoes again, I roasted them, mashed them, and–still hot–put them with vanilla ice cream, as a friend had taught me to do. (Note: certain vanilla ice creams work better with it.) I’ve since tried my hand at homemade ramen noodles, various side dishes, and nabe, which is one of my favorites. After visiting South Korea, I tried to make black bean noodles (jajangmyeon). I’d love to figure out how to make the shaved ice I had. Surprise, surprise, it also had sweet potato. Preempting my move to Hungary, I made cabbage rolls.